While many adults prefer rugelach filled with preserves and nuts, kids tend to enjoy the chocolate-filled variety. Americans typically fill their chocolate rugelach with mini-chocolate chips, while Israelis will make their own chocolate filling. This version follows that Israeli tradition, which usually includes a touch of cinnamon. In a mixing bowl, cream the butter and cream cheese together. Add sugar and vanilla, and mix until smooth. Add flour and mix lightly. Refrigerate dough for an hour or more. Preheat oven to 350 F.
Divide the dough into four balls. On a floured surface, using a floured rolling pin, roll one ball out into a circle until about 1/8-inch thick. In a small bowl, mix together the cocoa, cinnamon, sugar, and grated chocolate. Spread some melted butter on the center of the circle. Sprinkle the chocolate mixture on top. Cut the pastry into pie-shaped wedges. For bite-size and nice looking rugelach, the thick end of the wedge should about an 1- to 1 1/2-inch wide. Start at the wide edge of the wedge and roll the dough up toward the point. Line a cookie sheet with parchment paper. Place each pastry, seam-side down, on the paper. Brush each pastry with the egg and sugar. Be careful with how much filling you're adding—using too much leads to messy-looking rugelach. If you don't want to use parchment paper, you can spray the cookie sheets with non-stick spray. A pizza cutter makes it easier to cut the dough into pie-shaped wedges. After rolling the dough up and placing on the parchment paper, you can stick them in your freezer. 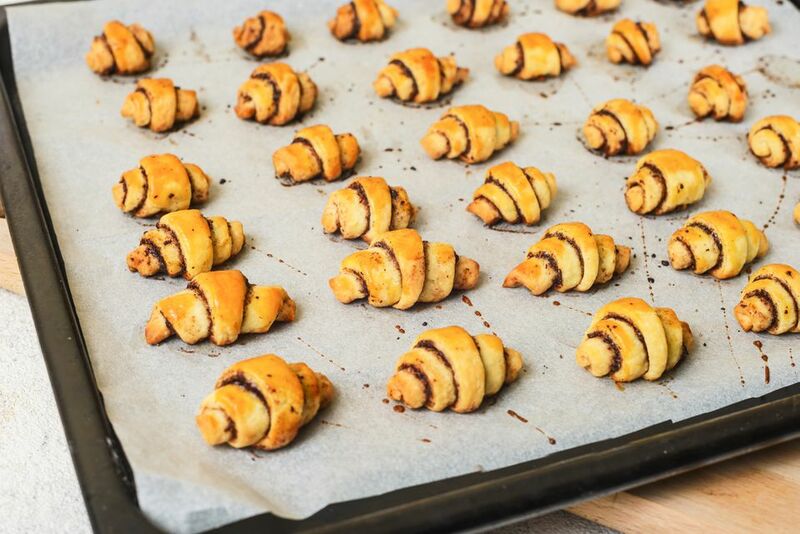 When you need fresh rugelach, take them right from the freezer into the oven and add a few minutes to the baking time.